Scottsdale man accused of lighting store in fire, vandalizing businesses and cars. 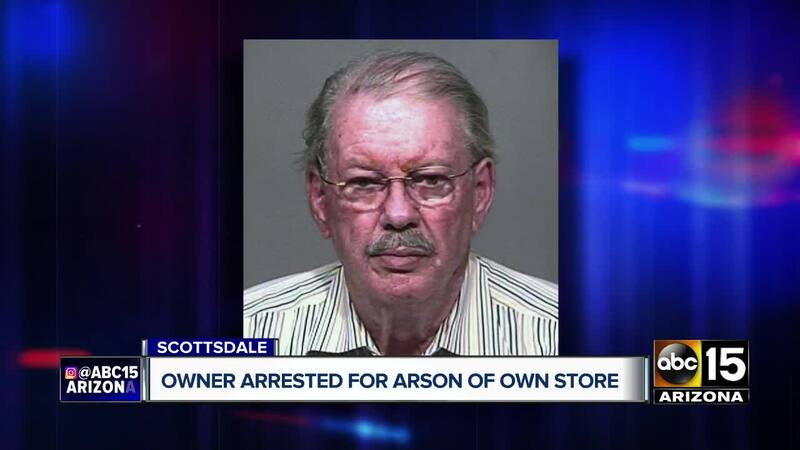 SCOTTSDALE, AZ — Authorities have arrested a businessman for starting a fire inside his own business. Firefighters responded around 4:30 Sunday morning to a strip mall near Pima and Pinnacle Peak roads. Firefighters and the business' sprinkler system contained the flames inside High Desert Rugs and Furnishings, according to a release from the Scottsdale Police Department. Several other businesses in the complex and cars in the parking lot were defaced with spray paint. Police said it appeared the vandalism was connected to the fire, and that the fire appeared suspicious. Investigators say they have evidence that the owner of High Desert Rugs was responsible for both. James Waller, 75, was arrested later in the day Sunday on charges of arson and criminal damage. He was released pending felony charges from the Maricopa County Attorney's Office, according to Scottsdale police.